Brother Luminaire Innov-is XP1 See it first at all Moore's SoCal locations! Brother Luminaire Innov-is XP1 is a technological breakthrough in sewing, embroidery and quilting technology. You will instantly feel a rush of excitement when you see the Luminaire’s StitchVision technology. The first of its kind, it projects a virtual reality image of your embroidery, sewing stitch or quilt pattern, in its true size, color and proportion. This makes embroidery placement and stitch auditioning a pleasure, instead of a chore. Quilters will love the guide markers that can be set in all types of seam allowances including ¼” or even a scant ¼”, plus angles for the most precise guidance in sewing binding and triangles, without the need for painter’s tape on the bed of your machine. This machine is a must see. Stop by a Moore’s location for a demonstration of the new Brother Luminaire Innov-is XP1 today! Brother Luminaire Innov-is XP1 is the new star in the sewing world! Adorned with revolutionary StitchVision Technology, which, through an innovative projection of light, helps you to find perfection in every stitch. It’s an enlightened sewing, embroidery and quilting experience, powered by technology that’s light years ahead! Brother Luminaire Innov-ís XP1 is equipped with exclusive STITCHVISION TECHNOLOGY! Use the StitchVision Technology for virtually perfect placement of your embroidery design. After choosing an embroidery design, select the StitchVision Technology icon on the LCD display. You’ll see your embroidery design projected on your hooped fabric, allowing you to get a realistic preview before you begin embroidering! Introducing StitchVision Technology for sewing, a revolutionary system for virtually perfect stitch positioning! Also, more precise previews via an intelligent projection of light. Furthermore, with the Brother Luminaire Innov-ís XP1 you can preview, audition, and edit designs and stitches directly on your fabric! Use the innovative Dual-Purpose Stylus that’s included with your Brother Luminaire Innov-ís XP1. Make adjustments to your stitches directly on your fabric for even more accuracy than ever before! Adjust your stitch width, length, and left/right shift using the revolutionary stylus. Want to choose a different stitch? Easily switch your stitch design by pressing the left or right arrow keys using the stylus. Dual uses for maximum efficiency – the soft tip works on the LCD display, allowing you to select, move, or enhance projects directly on the screen! Above all, the simple and intuitive 10.1″ capacitive touch screen works like a tablet with familiar sliding, swiping, scrolling and pinch-to-zoom for viewing detailed steps, categories and designs. The user interface offers large, defined crystal-clear icons, and color navigation for easy viewing. BUILT-IN INSTRUCTIONAL MANUAL AND TUTORIAL VIDEOS (version 1.2) Tutorials make learning easy! Furthermore, view over 30 tutorial videos, or stream your own creations using the industry standard MP4 format. The 5″ x 3″ virtual preview area also displays a guideline marker in single, double, angled, and grid-lines. For example, use grid-lines for creating multiple rows of parallel stitching, pin tucks, hems, curtain rod pockets, decorative stitches, cross hatch quilting,00000 smocking and more! When creating mitered corners, sashing strips, or Y seams, diamond cross hatching, or square corners, use the projector to preview your angle lines. A built-in embroidery pointer is shown as a ‘T’ mark on your fabric. Also, three color choices ensure visibility, regardless of fabric color. The pointer can show the center of your embroidery design as well as the needle drop position on the fabric! Now more brilliant than ever before! The powerful, high-color LED lighting keeps your work space bright, with less glare and fewer shadows. It’s easy on your eyes! Even more, regulate the brightness between five settings, including an “off” mode to help find your ideal level. EXPANSIVE WORKSPACE AND EMBROIDERY AREA – 65 SQUARE INCHES OF WORKSPACE – 13.1″ NEEDLE TO ARM! Achieve the unimaginable with 65 square inches of workspace. Projects of any size are easily managed. 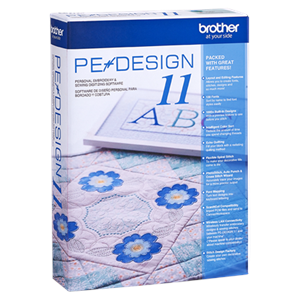 Our largest 13.1″ needle to arm is a dream for any quilter with the ability to accommodate a rolled king-sized quilt! 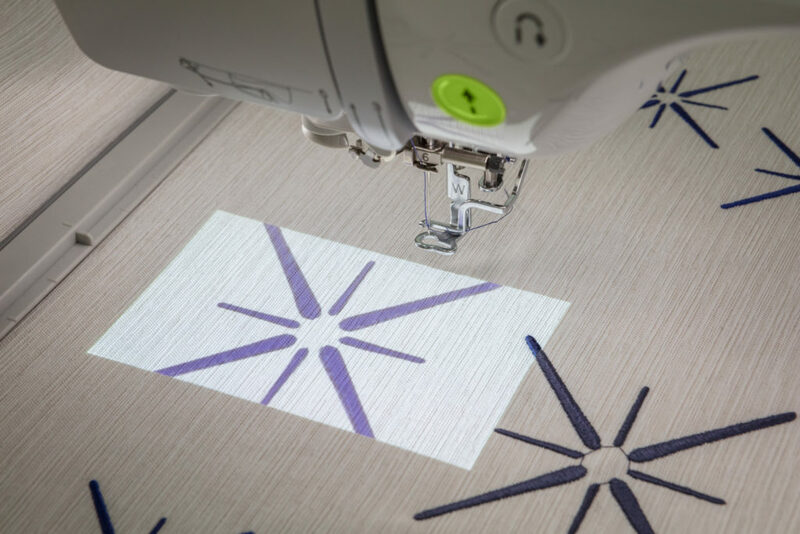 The Brother Luminaire Innov-is XP1 has ENHANCED ACCUTRAC EMBROIDERY SYSTEM, engineered for superior stitch quality! Also, our advanced AccuTrac embroidery system has been enhanced to offer more embroidery arm support in both horizontal and vertical directions. Make your projects larger than life with the Brother Luminaire innov-is XP1’s 10-5/8″ x 16″ frame, the largest that Brother currently offers. This extra large frame has efficient rubber plates on both sides of the inner frame to hold fabric securely. Plus a Spring Lever Release that makes it easy on your hands when hooping fabric! With the Brother Luminaire Innov-is XP1, you can let your imagination and creativity run wild! An extensive library of over 1,100 built-in embroidery designs such as Disney, Anna Aldmon, Zundt, Zentangle and Pierre Joseph Redouté. Brother Luminaire Innov-is XP1 Stitches Can Be Customized in almost infinite combinations! You can use 234 of the built-in stitches for embroidery! Brother Luminaire Innov-is XP1 Creates Designs Without The Need Of A Computer! My Design Center integrates with our industry-first Innov-Eye Plus Technology to offer design capabilities at your fingertips, all without a PC! There are so many ways to create custom personal works of art – and a really fun way to create embroidery! Draw or doodle directly on the LCD display and watch it spring to life in the large drawing area. Or, use the industry-first ScanImation Scanning Frame to scan drawings, line art, handwriting, or printed clip art and have it transformed into embroidery data. Or, import a JPEG using the USB port, and watch in amazement as the image is turned into stitch data using just the machine. Each accessory has been carefully chosen to give you the best tools to complete your projects. Plus, we offer a range of optional accessories you can choose from to enhance your experience even more! Embroider monograms and other small designs with the 4″ x 4″ frame. Use the 5″ x 7″ frame for clothing embellishment or choose the 9.5″ x 9.5″ hoop for quilts and jacket backs. Accommodate your largest designs on the 10-5/8″ x 16″ frame – our largest frame to date! Additionally, choose from a wide array of feet! Particularly noted are the free-motion quilting “C” foot, a free-motion echo quilting “E” foot and a 1/4″ piecing foot for effortless quilting. Plus, the included industry-first camera detecting buttonhole foot can detect the button and automatically determine what size buttonhole to make. Designed to fit within the arm of the Luminaire, the accessory case will keep all your tools neatly organized and out of your way when not in use. Open the top cover to easily attach the included magnetic Dual King Spool Thread Stand. This space-saving innovative spool thread stand helps ensure proper thread delivery. It also helps prevent broken and distorted stitches and uneven tension. Adjust the lever in three angles for your ideal sewing position. Adjust the presser foot in four different heights. And of course, free guide classes with purchase, at any Moore’s SoCal locations! Click here for a list of upcoming classes! Stay tuned for more information on PE-Design 11! Check out our other Embroidery Machines below! I can not begin to tell you how much I love this machine. The projection feature alone is WOW. The quietness and quality of the stitches. It is very easy to use and on screen manuals make it so easy. The lighting is awesome and with the ability to bring in a jpeg and transform it into a digital design makes this machine invaluable. I could go on and on about my love for this machine. Thank you George for the great offer of the Golden bobbin club and thank you for this great machine. If anyone is on the fence about purchasing this machine DO IT. I’m glad I did. I can’t say enough. I am giving my rating for the sewing portion of this incredible machine. I have yet to use the embroidery part, but I sew regularly and find it is smooth, accurate and wonderful to use. Stunningly beautiful sewing and embroidery machine!!!! So quiet , you hardly know it’s running. The projection system is my absolute favorite. Could not love this machine anymore than I already do!! I’m in heaven, this machine is a game changer. I feel confident with projects I would never have tried before. THIS MACHINE IS SO AMAZING THAT I JUST HAD TO HAVE IT. THE NEW ITEMS THAT THEY PUT ON MAKES SEWING AND EMBEROIDERY SO EASY. MY HUSBAND WHO SEW ALITTLE FINISHED HIS MINION QUILT ON THE NEW BROTHERMACHINE AND SAID KEEPING THE 1/4″ WAS SO MUCH EASIER WITH THEPROJECTION OF THE LINES,HE WAAS ABLE TO SEW MORE ACCURATELY. I’VE ENJOYED THE EASY OF EMBROIDERY AND USING THE LARGEST HOOP, IS NOW A BREEZE WITH THE SPRING LEVER RELEASE MAKE IS SO EASY. THE NEW HIGH DEF SCREEN SO SO MUCH EASIER ON THE EYES. I RELLY WASN’T GOING TO GET ONE FOR MYSELF ONLY FOR MY DAUGHTER AND GRANDDAUGHTER BUT AFTER SEEING GEORGE’S DEMONSTRATION I HAD TO HAVE ONE FOR MY SELF. I didn’t want to give up my Quattro2, but I am so happy with the new XP-1. This has to be the best embroidery machine on the market. The ease of use is amazing. You can tell it is a quality product, great engineering. It is so quiet. I started right in and did some large pieces. What a dream. I was originally caught on the price. But, after watching some of the introductory videos, and then saw what the machine does when it was demonstrated at Moore’s, I did not hesitate. It will save me time, it will allow me to do larger projects, and it will help me develop new designs. Fantastic machine. Easy to use and has a huge embroidery area. I am a guy and wont let anyone else try it. This machine is thrilling! I’m excited by the built-in designs and the scanning and projection technology. But best of all is the capability for designing embroideries right in the Luminaire, no computer required! So far I love my new Luminaire. I love the satin stitches, and how good the stitches tie off in the back, so I can cut close to the tie off knot. I also love how quiet it is while stitching. But the best part is the projection imaging on your fabric to see if the placement of your design is where you want it to be before you even begin to stitch it out. I would definitely recommend this machine to anyone who loves Machine Embroidery!! I love the new thread stand. The pointer Laser is much easier to see than the old dot. The machine is quieter than Destiny. I love the new thread stand. Laser is much easier to see than the old dot. The machine is quieter than Destiny. I’ve been embroidering on my new Luminare it’s incredible. I especially love the projection and placement features. It’s so quite and stitches beautifully.. It’s beyond amazing. There’s still so much more I’m yet to use on it. This machine is all it’s cracked up to be. I’ve traded in my Dream Machine & haven’t had a moment’s regret. Of course the projector, extra laser line & improved embroidery is great. Plus, it actually sews smoother & better than the Dream Machine (which was already fantastic. LOVING this baby! When I saw the Luminaire at Moore’s Tech Party, I knew I had to get one. I’ve already used the projection guidelines on an appliqué quilt I’m making. It made it so easy to align the blanket stitch perfectly along the edge of the appliqués. Some of the simplest new features are worth the price of admission – the throat plate that removes with the slide of a button instead of having to deal with a screwdriver; the ginormous embroidery hoop; the list goes on and on. I am so looking forward to making all kinds of wonderful embroidery projects! I love my Luminaire, it’s so quiet and sews perfect in every area. I was able to quilt my table runner in one afternoon with the built in designs. The only drawback is I don’t have enough hours is the day to sew on it. I haven’t found anything that I-can’t figure out it is so user friendly as all the Brother products are and the Brother site was very helpful with the update. Thank you Moores and Brother. I’ve only had a few days to play with my new machine, the Luminare. It is so much fun. I’m looking forward to the classes to learn more about my machine. We have been out of the country for the first class, but will attend the 2nd and3rd classes. I can’t wait to learn how to do everything with my new machine. My husband will miss me as I find more projects to do on it in my office. Look Out world, here I Om! I LOVE, LOVE, LOVE, my Luminaire XP1 !!! I am one who puts MANY MILES of stitches on my machine! This machine is very quiet as she embroiders my projects! I love all the new features! The larger hoop is a plus. At first I really didn’t want to give up my Dream Machine but now I have no regrets. I know I will enjoy it more once I learn to bring in my designs in through the PE Design 11. I really feel this machine will deliver all my expectations. Anyone who might be hung up on the price….just know this machine is worth every dollar! This machine has been a real game changer for me! Thanks George for all the support and guidance Moore’s offers to us! Wonderful machine. Have been able to quilt easily around designs using the designs in completed quilt top using the projector for placement. Have used the guide lines to stitch 3 inch decorative stitch down border on quilt. Easily stitched the Molly Mine largest Christmas stocking, fully lined in hoop. (many layers to stitch when putting together, made the quilted fabric for the stocking in hoop, no difficulty handling all layers) Software a real plus, at first glance looks like will be much improved over my previous older 6D. Very nice machine, would recommend to anyone who loves to sew and enjoys all the new technology. This machine is amazing! I was up and embroidering in no time at all! The Luminaire XP1 is amazing! I thought the stitching on the Dream Machine 2 was awesome, but the Luminaire is absolutely stunning! I’m just beginning to learn the sewing features and have a long way to go. I’m excited to learn as much as possible. Brother is very quick to respond to questions/issues and their customer service is top notch, as is the customer service at Moore’s. Wow,so quiet and beautiful stitches. New features are many. I especially love the projection of design directly on fabric. So happy I upgraded to this machine. I am so in love with my new Luminaire. I have already taken it “for a walk” and embroidered my husband’s golf shirt using the new projection feature. This is one of the best features to comes to in over a decade. The Moore’s Tech Party was very informative but I am looking forward to the instructions to see what other creative projects are in my future. Loving this!!!!! I’ve been having so much fun playing with my new machine! Love the projector’s functions, the lighting, the fact that it is quieter than previous machines. I was hesitant about it being any better than my Destiny, but I am not at all disappointed in the new features. There’s only one wish: Have a manual available for purchase. I constantly write notes in my books, and tag pages that I want to go back to. Can’t do that on a screen! I LOVE the Luminaire. It runs so smooth and quiet. I can talk on the phone and no one hears her in the background. There are sooo many features that will keep me busy learning which is great. It is fun to learn and make beautiful things at the same time. Just looking at her makes me SMILE with joy! It runs so smooth and quiet. I can talk on the phone and no one hears her in the background. There are sooo many features that will keep me busy learning which is great. It is fun to learn and make beautiful things at the same time. It is a fabulous machine and an a solo us joy to use. Lots of great features to keep one busy while leaning and stitching at the same time. This is a great machine; quiet, smooth, does not shred the thread like my dream machine did frequently. Feeds the fabric smoothly and the big screen is nice. Brother was quick to create an update to deal with some early problems like using the index. I am looking forward to various classes to become more familiar with it’s many features, and to have some questions answered.. I LOVE my new toy !! Have been making free standing haloween houses and a quilt already. The new laser guide lines are SO helpful, and makes it so easy to line things up! The new projecting function makes placement so easy and accurate. I just LOVE it! Now all I need is more hours in a day to play with it ! I loved my Dream Machine and did not think that Brother could top it,, but they sure did ! This is the greatest ! I love my new toy! The laser guidelines make it so easy to line designs up and the projection feature makes placement so easy and accurate! Did not think Brother could top the Dream Machine, but they did! Now all I need is more hours in a day to play with my new toy ! I thought my Dream was a true dream, but this machine is like a party every use. The quality of stitches is outstanding. The lighting is great, and I Love the no wrench entry for cleaning the bobbin area. I’m a novice at designing but I find it easier to do on this machine. I smile every day that I discover something new, its intuitive. Definitely recommend. Glad to hear it! We’d love to see what you’re making!